The Meditation Teacher Training program at Shree Mahesh Heritage is a 300-hour certification program for beginners or advanced meditation practitioners who wish to become a meditation instructor. It is a 28 days residential course which is derived from Ayurveda or meditation techniques. It is the best practice course for self-practice and teaching techniques of meditation designed to prepare individuals to deliver professional meditation instructions to their clients, patients, family, and the general public. 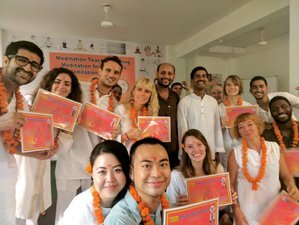 The Meditation Teacher Training course at Meditation School is a certified program registered by the government of India. The goal of meditation is to increase happiness and well being within and around. At Shree Mahesh Heritage the ancient teachings of the East are taught in a modern way suitable for the western mind and body so students can flourish in their practice and naturally gravitate to a more meditative lifestyle. There is no bias to any particular spiritual teachings and teach in a non-dogmatic way. Generally Western students consider meditation as quite challenging practice because they are not used to sitting for long periods in stillness. The focus is more on inner stillness and wisdom and to allow you to continue the same in various positions (sitting, standing, lying) and in activities. Any aspirant who wishes to become a Meditation Teacher can join the course. As well, it is a very effective course for RYT 200/500 - Certified Yoga teachers who wish to get their certification and specialization in Meditation. The course is designed in such a way that the student will get a complete picture of meditation, knowing well, how to begin, move and progress to achieve the ultimate state of meditation with the signs and symptoms of each stage. It is believed that the 'real' teachings come from all those who participate in the training discussing, sharing, exploring and debating practice and meditative lifestyle in the philosophy sessions. The depth of experience and the breadth of knowledge in your application of meditation t enable you to guide others in the enhancement of their mental, physical, and emotional well-being. All trainees who successfully complete the course will receive a 300-hour Meditation Teacher Training certificate issued by Shree Mahesh Heritage (registered under Trust act, Government of India) and are henceforth qualified to teach whatever style of meditation they love and practice. However, it must be noted that students must have 90 percent of attendance in all theory and practice session. Rishikesh is a small town in the northern state of Uttrakhand in India. Scenically located where the Ganges River comes down from the Himalayas. Rishikesh is in close proximity of Dehradun's Jolly Grant Airport, a small, quiet and recently renovated airport. From Delhi, the city is about 230 kilometers away and is well connected with buses. A bus journey may take about 5-7 hours - depending on the traffic - and costs you about 130-350 INR. An AC Bus will cost about 250-700 INR. In Rishikesh, there are several travel agencies scattered around Swarg Ashram and Lakshman Jhula that can book luxury buses to common destinations like Delhi, Jaipur, Agra etc. Haridwar is the biggest railway station, 25 kilometers from Rishikesh. There are many trains from Delhi to Haridwar. Some of the better are: Shatabadi Express, Jan Shatabdi, AC Special Express, Mussoorie Express. From Haridwar to Rishikesh, you can come by pre-paid taxi (fare-around 900-1000 INR) or bus (fare 35 INR) or by sharing Auto rickshaw (fare 35-40 INR per person) or through Train (fare 5 INR only) as listed below. Shree Mahesh Heritage is a well-known place for meditation teacher training, meditation retreat, and wellness through Naturopathy yoga and Ayurveda.